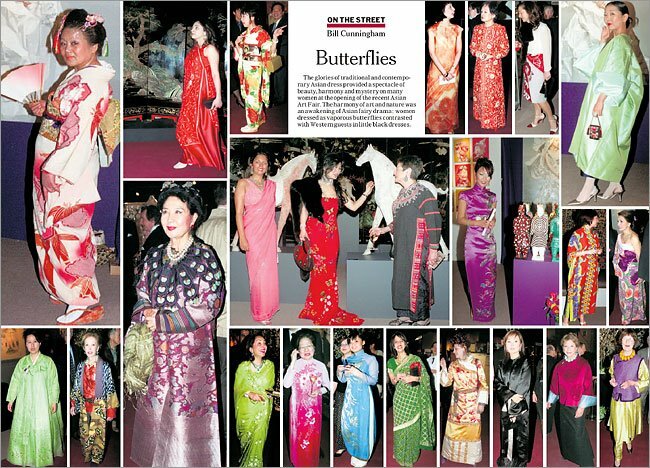 These candids were taken at a recent Asian Art Fair in New York, and appear in the weekend Times. I have always wanted a blue silk cheongsam... I love the mandarin collar, capped sleeves and row of buttons leading from the neck to the armpit. They are one of the more chic examples of traditional fashion. If you have ever flown on Singapore Airlines, you may have noticed that the female flight attendant uniforms are similar to the cheongsams worn by women to this event. I always admired how they could dart around serving food and giving safety demonstrations whilst buttoned into these hourglass shaped traditional dresses. Posted by la femme at 11:59 a.m.
those worn by the air stewardesses are actually called "sarong kebayas". 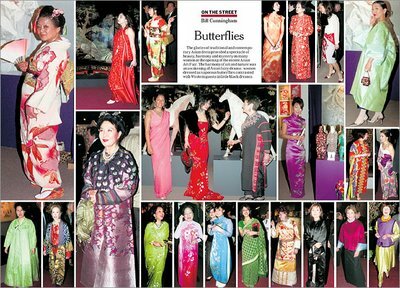 they are essentially malay traditional costumes.